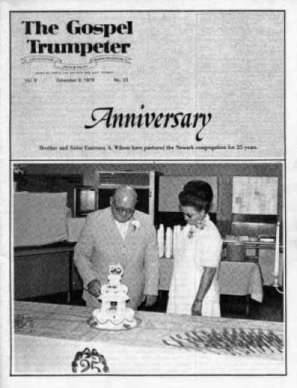 October 21, 1979, Brother and Sister Emerson Wilson celebrated twenty-five years of pastoring the Newark congregation. At this same time, they also commemorated their forty-first wedding anniversary. Much could be said regarding this celebration, but 1 Timothy 5:17 says it best: "Let the elders that rule well be counted worthy of double honor, especially they who labour in the word and doctrine." © 2002 - 2013 Church of God, Inc. All Rights Reserved.